Ask most long-term expats if Cambodia is a safe place to live and they will likely be too busy trying to hold back laughter to be able to answer. But don’t worry; it’s just a question that seems almost absurd to expats based here. The short answer is yes, Cambodia is a safe place to live. Twenty or 30 years ago it was the sort of question people asked before even entering the country. But times have changed and so has Cambodia. The truth is that a lot of expats here encountered anti-social or criminal behaviour in their homelands and have found life in Cambodia to be a great deal more stable and secure by comparison. But, of course, as a foreigner in a foreign land you should familiarise yourself with at least a little local knowledge and cultural understanding to avoid creating opportunities for problems to happen. This is a country on the rise with one of the fastest growing economies in the world and a booming tourism industry which the famously hospitable Cambodian people are equally proud and protective of. The growth in tourism from a few hundred thousand visitors a year in the 1990’s to nearly 6 million in 2017 is a major driver of jobs and business nowadays. And the more tourism develops, the greater the economic and employment benefits it provides. This is widely understood in Cambodia which has implemented tourist friendly policies to safeguard the industry and its visitors. The local police take any such crimes very seriously and penalties are harsh for those caught making trouble for tourists and expats. However, it is important for visitors to equally take into consideration ‘common sense tourism’ in how they conduct themselves. A little bit of courtesy really does go a very long way in Cambodia. But frankly, if you have no common sense, are rude and aggressive or a drunken buffoon then no country in the world will be safe for you. Thankfully most expats are not like this and will rarely encounter any situation that isn’t easily resolved with the use of a smile and a positive attitude. Showing respect at places of religious significance such as the country’s sacred temples is absolutely essential in terms of dress and behaviour. 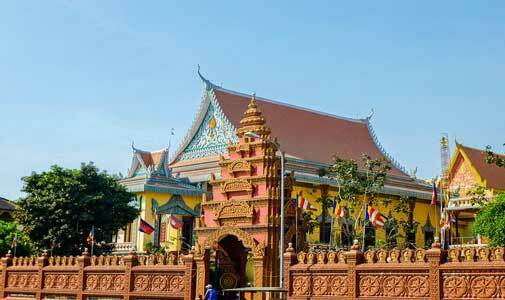 Do that and you will be welcomed and encouraged to learn about Cambodia’s magnificent culture and heritage. Cambodia is an extremely fortunate country in terms of its geography as it does not suffer from major geological disasters in the way other countries so often do. There are no volcanoes and there are no earthquakes here. There’s no chance of getting caught in a blizzard of snow either. And while it can get a little windy sometimes during the monsoon rains there is not really much history of the hurricanes seen in other parts of the region. There can be occasional cases of flooding in provincial areas while in the cities a heavy downpour sometimes can flood a few roads but these tend to disappear within an hour or so. Stay inside to keep dry and safe until the waters have subsided. The only real force of nature to be wary of is lightning in open areas of the countryside as it can lead to serious injury. To stay safe, simply don’t go outside during an electrical storm. In summary, there are many reasons why Cambodia is a safe place to live. If you act responsibly and use common sense then in almost every situation you will find very little gets in the way of leading a happy and secure life in the Kingdom of Wonder. Do live in a secure house. Make sure nobody can easily access the property without a key. Grills on the windows are a necessity, not to stop people from trying to break in but to deter them from the idea as soon as they see your house is secured. Grills on the windows means it’s too risky for thieves to consider trying anything. Do get travel insurance. Accidents happen, things get lost or even stolen on rare occasions but with insurance there to cover you it doesn’t have to be the end of the world. Buy yourself some peace of mind. Do learn the local road rules for driving. You wouldn’t drive in your home country without a license or some solid experience or lessons so why would a foreign country be any different? Familiarise yourself with the rules of the road, get your documents in order and never, ever drink and drive. Don’t park vehicles on dark streets. Vehicles need to be parked in a secure parking area otherwise you are creating an easy and expensive target for opportunistic thieves. Always park inside and you’ll be fine. Don’t withdraw thousands of dollars from an ATM at 4 a.m. You will make yourself a target. Got to the ATM during daylight hours and choose one attached to bank buildings where there is excellent security to keep you and your money very safe. Don’t walk around at night waving a $1,000 smartphone in the air. You are asking to be robbed. If you need to check your phone, do it in a way not to draw attention. Use two hands to hold it securely so anybody who does see will immediately see you are not an easy mark.